Originally I made the magic knife holder for knives but also found it handy in the workshop for tools. Children are also having fun with it, putting on spoons and metal toys, so I had to make 2 of them. I will probably make a few extras for gifts. For the base I cut some mahogany and glued two pieces together. This will give me a solid base and will also look better. After the pieces are dried I ran it through the table saw to clean it up and then tilted the blade and cut some bevels on it, this gave it a more pleasing look. The next step is to build the slide with the magnet. Basically it is just a small block of wood that fits the magnet and a hole to slide on the dowel. The two pieces below are marked, clamped and drilled together, this will keep everything lined up and straight. To install the magnet first mark the position where the magnet will go and make a center punch mark, I used a forstner bit and tapped it to get the mark. Then it was taken over to the drill press and drilled the depth of the cup. Note - a slot is cut in the cup, this will make it easier to take the magnet out of the cup if you ever have too. Here is a close up of how it looks. The slide is friction fit and will move along the long dowel easily but with enough grip to keep it in place. The second knife holder I made I used a spring loaded system for the slide. 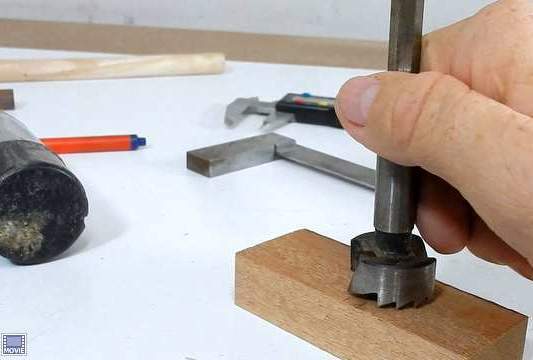 It is similar to my Dowel stop gauge, and not that difficult to make, just a lot of measuring, drilling and fitting a small spring. First drill a hole in the sliding block to fit the long dowel. Next, drill a hole in the side of the sliding block, then place a small piece of dowel in it and drill that one. Now drill the block a small amount more then clamp it and drill the small dowel a second time, this will make an oval hole. Lastly drill the block a third time and this will be for the spring. I just found a spring and cut off a small piece and tested it and it worked great. The slide with the spring system may be harder to make but it will ensure that in time the slide will always have a strong grip. The small and long dowels are both cut with my new bandsaw sled . The dowel is glued and tapped into base and the slide block is put on. The magic holders are easy to make and will sit nice on the counter in the kitchen or a workbench in the shop. I did not give the measurements for the length of the long dowel since it will depend on how long your knives are. The length I used was around 38 cm. Here are the dimensions for the spring loaded magnetic slide. For more details please see the video on how it was made. I hope this step by step article and the video will help you build your own. You can build this easy project in a small workshop or even in your kitchen with very few tools. Normally, these are usually nothing more than a tilted block of wood that allows the blades to be inserted into them, allowing the handles to protrude for easy access. This has been the classic knife holder design for generations and there have only been a few slight changes. You can find magnetic knife blocks at all leading department store retailers as well as on several online retail sites. The advantage of having a magnetic knife holder is that it has the ability to accommodate any type of knife, no matter what the size and shape of the knife is.